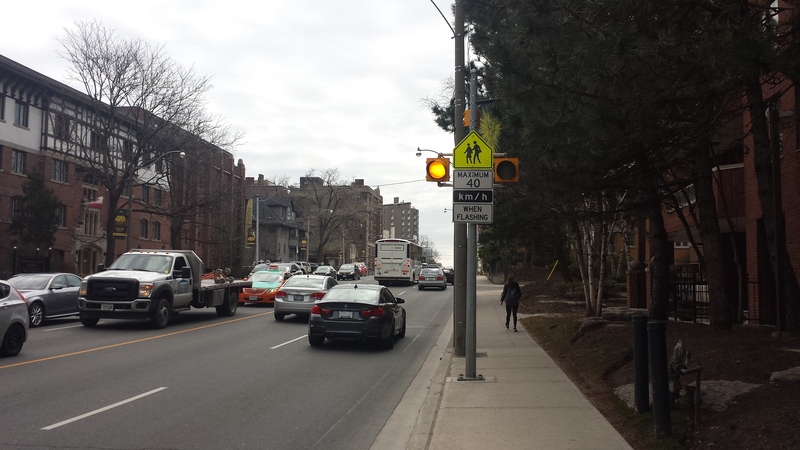 The City of Toronto’s 40km/hr Speed Limit Policy applies to local, collector, and minor arterial roadways. Lowering the speed limit on arterial roads or other roads with current posted speed limits of 50km/h or more will involve using the 40km/hr Maximum Speed Limits Policy. While 40km/h speed limits apply primarily to minor arterial roads, exceptions have been made for major arterial roads that have schools (where the limit drops during school hours). This policy may also be relevant for some local and collector roads. Not sure what kind of road you have? Read our road classification definitions, or search by street name, map or ward on the City of Toronto website. There is no community petition required for this policy, but there are other ‘warrants’ that must be met. To have lower speed limits implemented, a number of ʻwarrantsʼ will need to be met. Warrants are criteria that a policy must pass to be recommended for approval. They can include technical requirements such as block length, speed of traffic, or the proximity to a school or park. They can also be measures of neighbourhood support, such as a community petition, a poll, or a public meeting. Warrants are assessed by City staff who will prepare a report for the appropriate Community Council, if the warrants are met. A simplified version of the warrants for a 40km/hr speed limit is shown in the chart below; note that Transportation Services will do the studies to evaluate warrant criteria, and will use the original version, linked in the policy box above. If you complete the visioning process and meet with your Councillor and Transportation Services, they can advise whether or not a 40km/h speed limit is an appropriate solution for your street. Warrant A, B, or C must be met. An elementary or junior high school is beside the road 2. Road is beside parkland that has access to a school or park 3. Two or more locations of concern with steep hills and/or curves, with a safe speed of less than 50km/hr 2. Not enough distance to stop safely at two or more locations when travelling at 50km/hr 3. • Parking Enforcement Officers respond to immediate parking complaints. For a short term response, call the Toronto Police Service at (416) 808-2222. • Parking Enforcement Area Supervisors work with community members to explore, evaluate, and problem-solve parking related issues affecting the community. To explore long-term solutions, call your Area Supervisor at (416) 808-6600. • For other enforcement related concerns, school administrators can contact your school’s Community School Liaison Officer (a Police Constable with Toronto Police Service).